On the cover of the book containing the descriptions of the photographs is a hand written note reading “Photographs were taken by Capt. A.J. Russell Chief of Photograph Corps. U.S. Military Railroads.” A second handwritten note reads “This handwriting is that of Herman Haupt with which I am familiar. 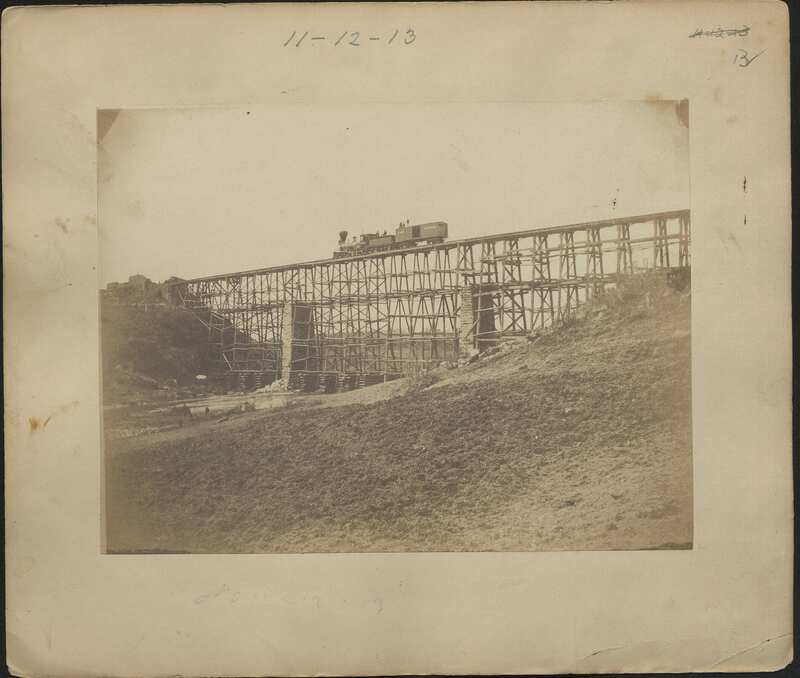 Edward Haupt July 19/1928.” Andrew J. Russell was the first official photographer of the Union Army and captured many of its engineering projects, including those overseen by Haupt. Russell is perhaps best known for his later work with the Union Pacific Railroad, capturing the historic meeting of the Transcontinental Rail at Promontory Summit, Utah. Haupt was adept at rapidly constructing bridges that helped the advancement of the Union Army. He was also skilled at damaging railroads to prevent their use by the Confederate Army and repairing the damage done to railroads by the Confederate Army. 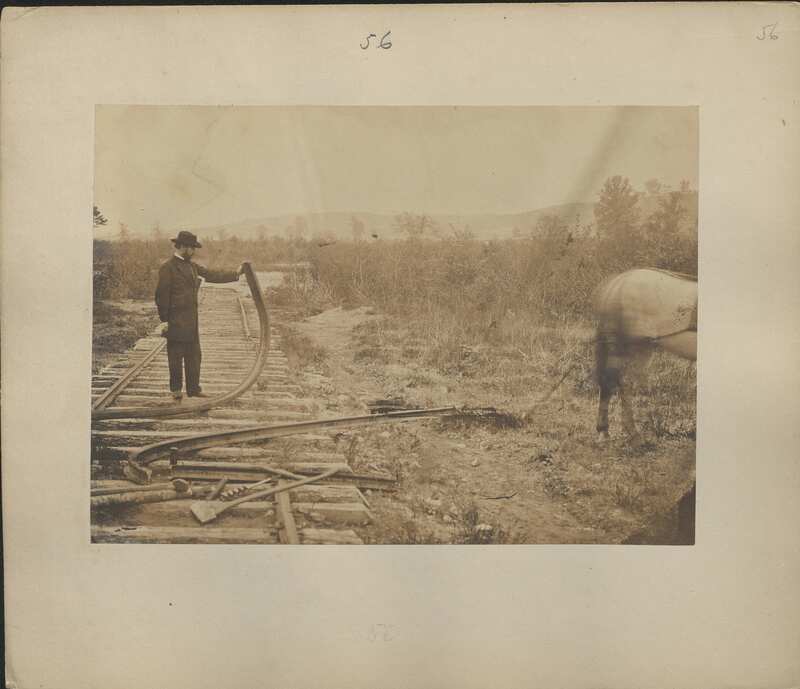 Many of the photographs depict the bending and straightening of rails by various different methods. This collection also includes illustrated recreations of many of Haupt’s and Russell’s photographs. A brief comparison of the illustrations with the original photographs reveals some subtle alterations. While many of the photographs feature black laborers, some the laborers in the illustrated reproductions are inaccurately portrayed as white. The digitized photographs and their descriptions can be found at Lehigh’s digital collections. Additional information about Lehigh’s holdings can be accessed in the finding aid for this collection. Read more about Herman Haupt at the National Archives website. See a complete set of these photographs at the Library of Congress. 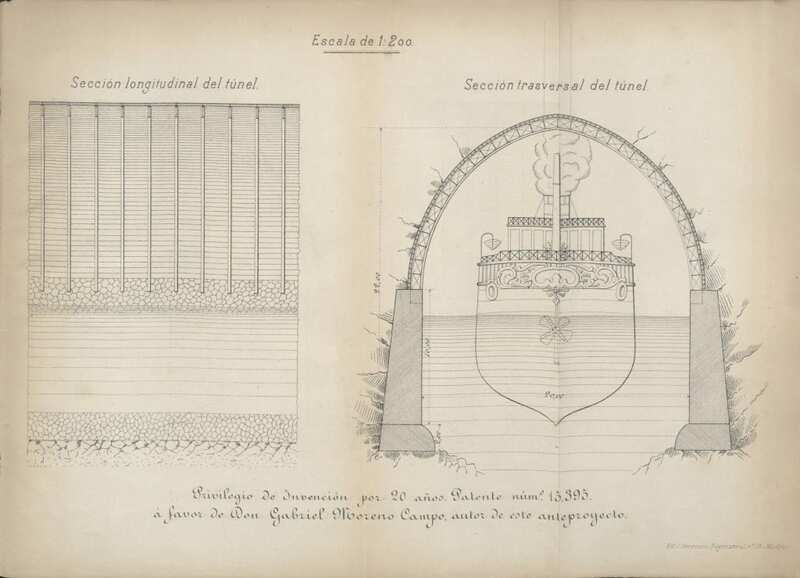 The archival manuscript “Memoria y Planos de un anteproyecto para la terminacion del Canal de Panama” has been digitized and made available in Lehigh’s Digital Library. More detailed information regarding this manuscript, as well as many of Lehigh’s other archival collections, is available in Special Collections’ archive guides. The title of this work roughly translates to “Memory and plans of a preliminary draft for the completion of the Panama Canal.” Given the subjects covered and the rich illustrations, this work could be of particular interest to those in the Lehigh community studying civil engineering. The manuscript is bound within stiff card paper covers of burgundy colored paper with gilt title and decorative borders. The pages are edged in red. It is illustrated with three folded plans including two blue prints: Proyecto de construccion en túnel Plano, Perfil longitudinal por el eje, and one lithograph by C. Ferreiro illustrating a tunnel. The Panama Canal began construction in 1882 and was completed in 1914. This resulted in the creation of a highly prized trade route connecting the Atlantic and Pacific Oceans through the splitting of the American continents. As the earliest date recorded in the manuscript is 1892, it was written while construction on the canal was ongoing. The manuscript was considered a significant contribution to the engineering community as it was awarded a gold medal by the Academia de Inventores of Paris in 1894. The author of this work, Gabriel Moreno Campo, appears to have been based in Spain and been involved in the iron and railroad business. 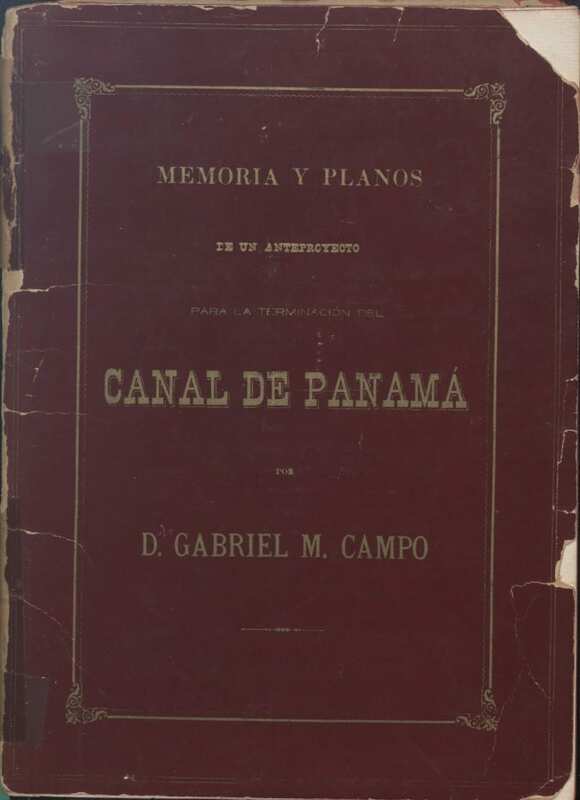 Campo had also published plans for the creation of a transoceanic canal located in Colombia, the construction of which was awarded to an international company in 1876 but ultimately failed. The Bucyrus Company, which manufactured steam shovels and dredges, was headed by Lehigh alumni. The cement used in the Panama Canal building came from the Lehigh Valley and the steel gates for the five sets of locks used to construct the canal were manufactured by the company of Lehigh alumni McClintic and Marshall (LU CE 1888) in Pennsylvania.